This beachfront property is designed for families and will also cater to your wedding and group needs. Guests have endless choices; a private, adults-only pool, a recently remodeled mini waterpark for children and a full activities program with spectacular theme shows for the entire family. Enhance your stay with an extensive variety of gourmet dining including à la carte Mexican, Italian and International buffets. 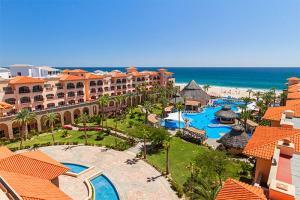 Royal Solaris Los Cabos Resort is located on the beach along the Sea of Cortez in San Jose del Cabo.